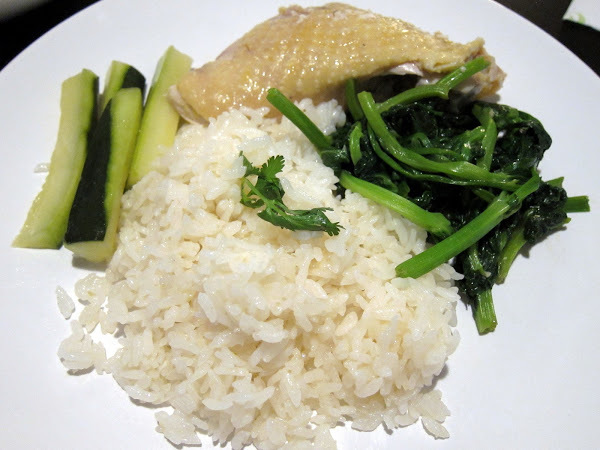 Hainan Chicken & Rice – Overworked. Underfed. Dumpling Man really likes Hainan Chicken &amp; Rice. It’s a pretty simple dish that I usually cheat to make since I never wanted to attempt poaching my own chicken and making my own rice. So I’ve used various versions of this pre-made seasoning in a jar over the years, and Dumpling Man has always been pleased. 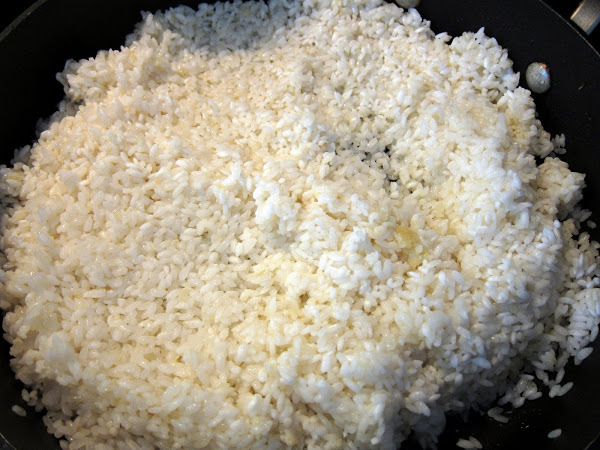 All you do is add a couple scoops to your rice and then pop it in the rice cooker. 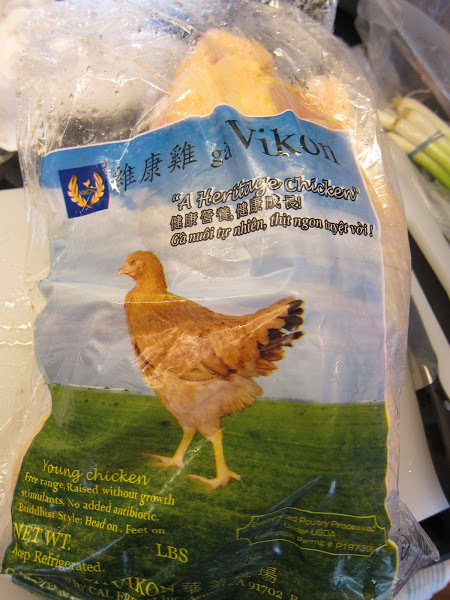 As for the chicken, I usually season it and slather it with some ginger and steam it. Anyways, I decided to hunker down and do it all from scratch. 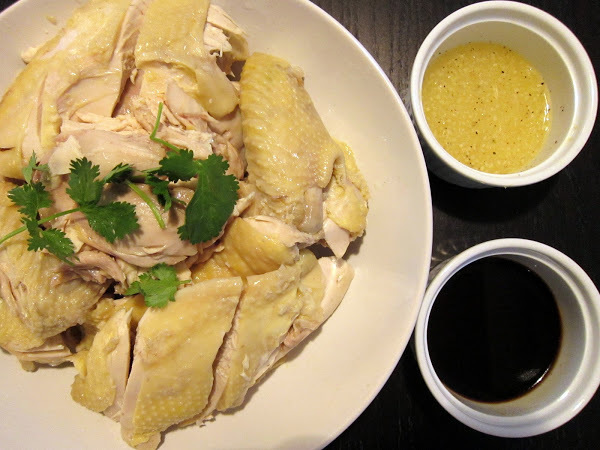 Watching the episode of No Reservations, when Anthony Bourdain visits Tian Tian Hainanese Chicken and Rice Stand in Singapore, was the final push to try and do it. They showed the process of poaching the chicken and using the poaching liquid to make an aromatic delicious rice. I found an easy enough recipe at Steamy Kitchen. 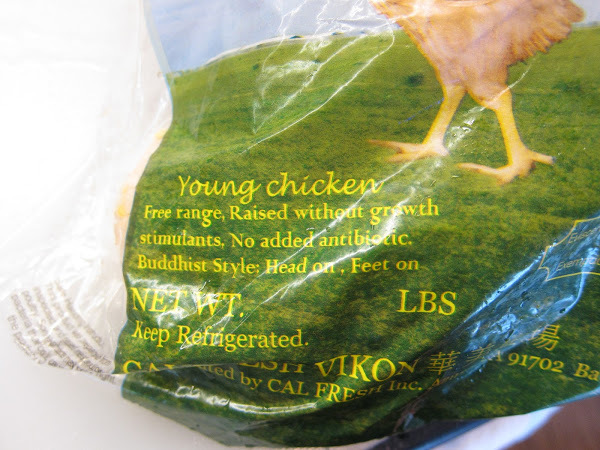 So when my mom makes bun thanh, which is a kind of Vietnamese chicken noodle soup dish, she says it should be made with a free range chicken. She’s not very clear on why, but it’s supposed to be better. This recipe too, called for a free range chicken. I have no idea how many pounds the chicken was, but by my guestimation it was at least 4 lbs? Ok the next couple of pictures are going to be quite graphic for some of the more sensitive souls, i.e. Care Bear. I was quite surprised to see the head and feet still attached, but I manned up. After cleaning and thoroughly rubbing the body with salt, then stuffing it with slices of ginger and green onions, you plop into a big pot full of cold water. After bringing it to a boil, you simmer it for 20-30 minutes. Sadly, my pot was not big enough for my chicken to swim freely. 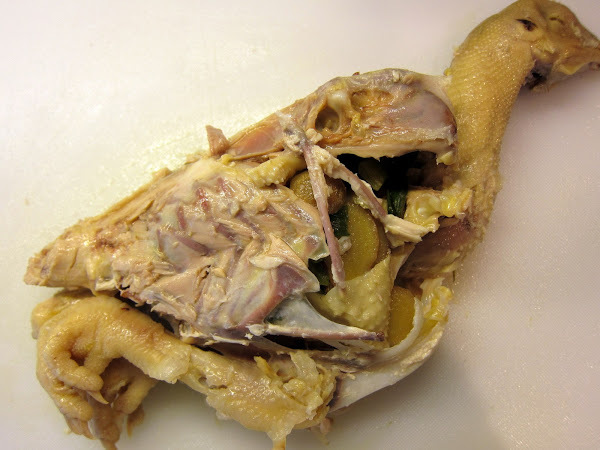 After your chicken is done poaching your left with a very rich, and fatty, delicious stock. 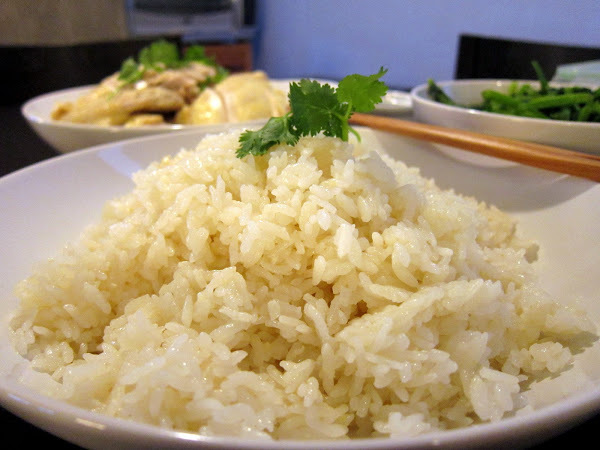 To make the rice, you mince up some garlic and ginger and fry it up in a little bit of oil. The most delightful aroma will start to fill your kitchen. To this, you’ll add your rice, and then your stock. It’s definitely a lot easier than making risotto, which is such a slow tedious process. This only takes 15 minutes! So now your chicken is ready for carving! Don’t be intimidated by having to carve a whole chicken. Youtube has many videos demonstrating how to do so successfully and easily. After stealing the chicken of all it’s meat, this was all that was left. He did not die in vain. So I guess what makes this dish special is the sauces you eat it with. I like spicy things I suppose, but I don’t really ever cook spicy. So my Hainanese chicken is not eaten with a spicy dipping sauce. Rather I have a sweet soy sauce and a lemon ginger sauce. Just grate some ginger, lemon juice, salt, sugar, pepper. It’s nice. I thought the rice tasted pretty darn good. I couldn’t really remember if it tasted different from the jar version, but I recently made that version of rice and it’s markedly better when you make the rice from scratch. You can really taste the aromatic ginger and garlic that is highlighted by the fresh chicken stock and luscious chicken fat. Very good. 1. To clean the chicken, with a small handful of kosher salt, rub the chicken all over, getting rid of any loose skin and dirt. Rinse chicken well, inside and outside. Season generously with salt inside and outside. Stuff the chicken with the ginger slices and the green onion. 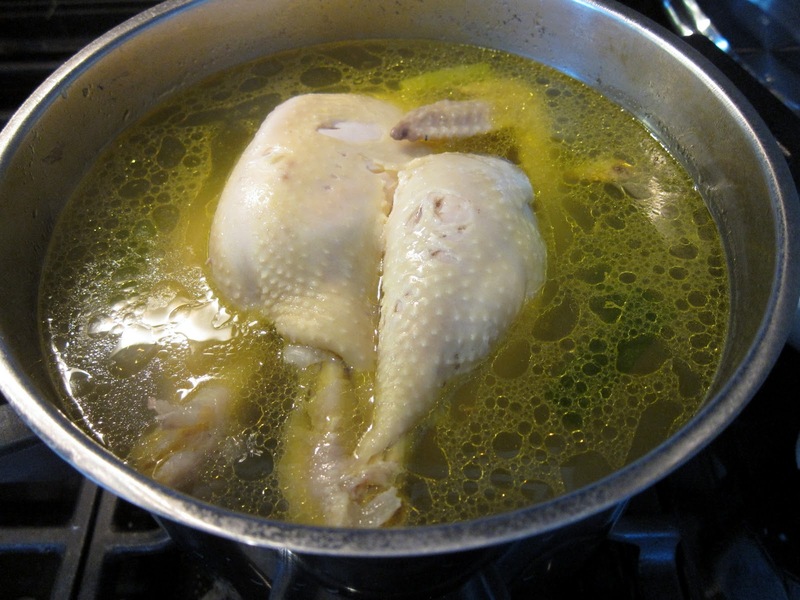 Place the chicken in a large stockpot and fill with cold water to cover by 1 inch. 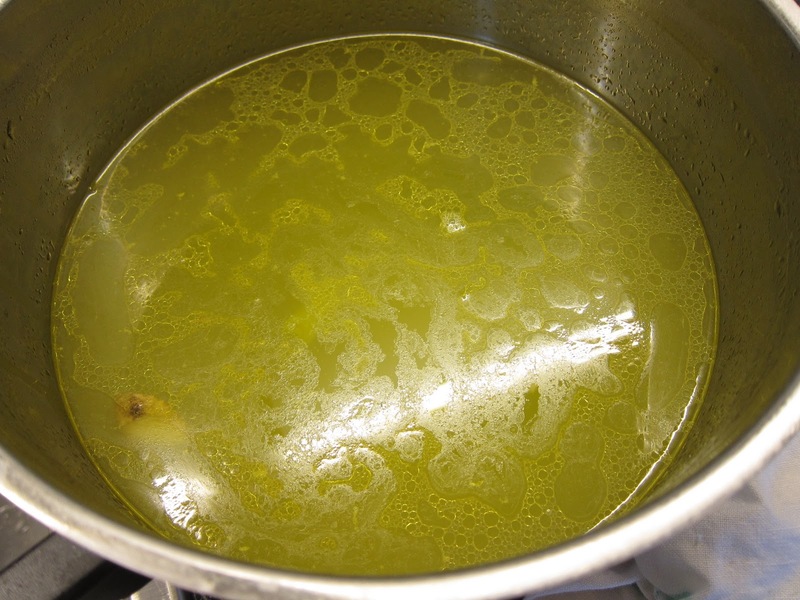 Bring the pot to a boil over high heat, then immediately turn the heat to low to keep a simmer. Cook for about 30 minutes more (less if you’re using a smaller chicken). 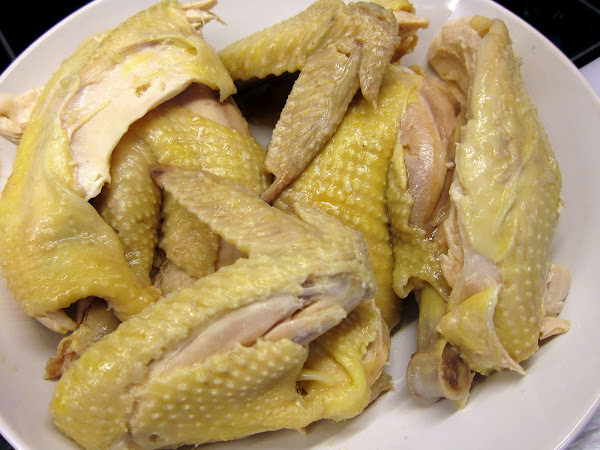 Check for doneness by sticking a chopstick into the flesh under the leg and see if the juices run clear or insert a thermometer into the thickest part of the thigh not touching bone. It should read 170F. 2. When the chicken is cooked through, turn off the heat and remove the pot from the burner. 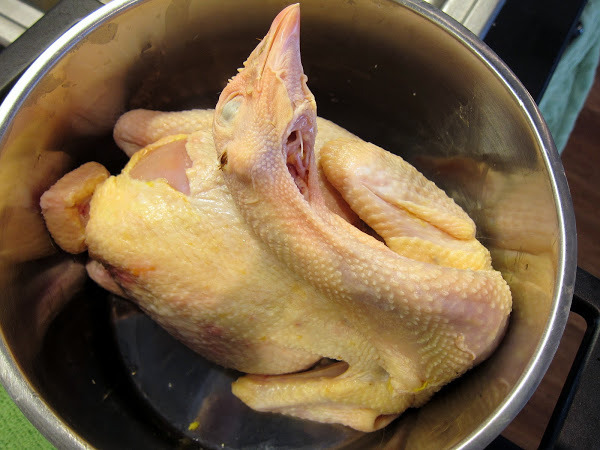 Immediately lift and transfer the chicken into a bath of ice water to cool and discard the ginger and green onion. Don’t forget to reserve the poaching broth for your rice, your sauce, and the accompanying soup. The quick cooling will stop the cooking process, keeping the meat soft and tender, and giving the skin a lovely firm texture. 3. To cook the rice: Drain the rice. In a wok or sauce pan (use a medium sauce pan if you plan on cooking the rice on the stove top), heat 2 tablespoons of cooking oil over medium-high heat. When hot, add the ginger and the garlic and fry until your kitchen smells like heaven. Be careful not to burn the aromatics! Add in your drained rice and stir to coat, cook for 2 minutes. Add the sesame oil, mix well. 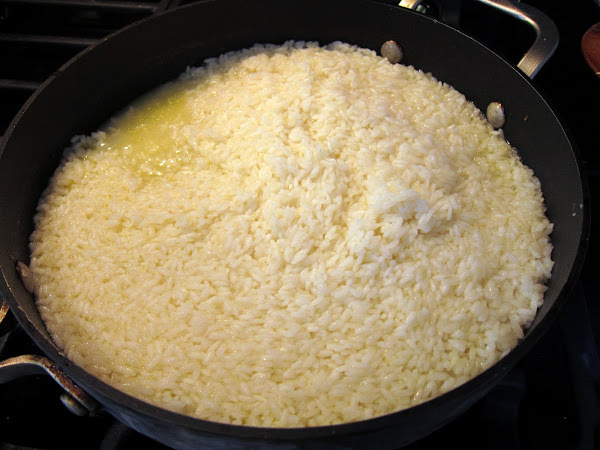 To make the rice on the stove: In the same sauce pan, add 2 cups of your reserved poaching broth, add salt and bring to a boil. Immediately turn the heat down to low, cover the pot and cook for 15 minutes. Remove from heat and let sit (with lid still on) for 5-10 minutes more. 4. 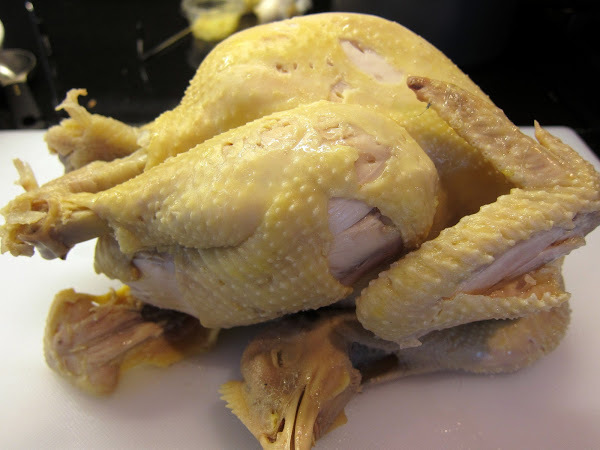 While your rice is cooking, remove the chicken from the ice bath and rub the outside of the chicken with the sesame oil. Carve the chicken for serving. Don’t mind those wilted looking cucumbers. They’re pickled and taste better than it looks.